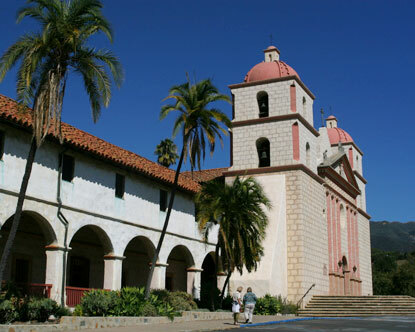 The Santa Barbara Mission, recognized as both a State and a National Historic Landmark, is still operated by the Church for its original purpose. The City of Santa Barbara (population 91,621) is sometimes referred to as the American Riviera. Beautiful beaches, majestic mountains and colorful culture make Santa Barbara a premier resort destination. The City has its origins in the construction by the Spanish of the Presidio de Santa Barbara in 1769. Legend has it that, while the Spanish explorers were in the harbor, the weather was stormy and the sailors prayed to Saint Barbara, patron saint of those in danger from thunderstorms, for their safety. Upon morning’s light all was safe and thus they named the area in her honor. Farming has been the basis of the area’s economy for thousands of years, through periods of local occupation by the Chumash Indians (pre 1700s), the Spanish (1769-1820), Mexico (1820-1848) and finally the United States (post 1849). The entire region continues to enjoy a strong economy based upon agriculture, industry and natural resources such as oil and gas. The Santa Barbara Mission, today recognized as both a State and a National Historic Landmark, was the tenth California mission to be constructed and is still operated by the Church for its original purpose. In 1918 community leaders launched a plan to convert local buildings to Spanish style architecture. Though devastated by an earthquake in1925, the downtown was rebuilt according to this vision of a “New Spain in America.” Civic leaders formed an architectural review board that reviewed all designs for reconstruction and is still active today, some 80 years later. Appropriately, Saint Barbara is also viewed as the patron saint of architects, builders, and stonemasons. For a resort such as Santa Barbara, renowned for its architecture past and present, having such a namesake is wonderfully fitting. Since 2004 a new generation of public and private sector partners has collaborated on the conservation and restoration of the Santa Monica Courthouse, completed in 1928. Architects, designers, and illustrators from around the world have studied the Spanish-Andalusian Revival architectural detailing of this beautiful complex, a much-photographed local gem that was designated a National Historic Landmark in 2005. Visits by design teams and by other tourists stimulate the local economy. In order to preserve the historic character and architectural beauty of the city, Santa Barbara has embarked on an ambitious plan to conduct historic property surveys in each of its neighborhoods over the next twenty years. This information will inform planning for future growth and development.